For one of our latest office fit out projects we were required to bring the outside in. Working alongside the clients designer, we were tasked with using materials, colours and furniture which reflected nature and gave their staff a feeling of being outside rather than within a traditional office space. Office fit out briefs like this are fun to with and the end result always looks great. 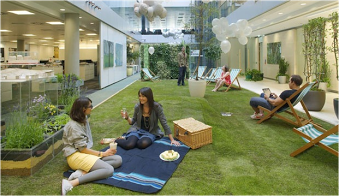 Here's a few tips on how to get an outdoor feel in your office. For the ultimate in 'outside in' design, why not lay artificial grass instead of carpet? There are many other themes that can be used in office design, how about a circus, fairground or play theme? Perhaps something nautical or beach inspired? Taking inspiration from hotel layouts is useful, particularly when thinking about collaborative workspaces. If you're thinking of something adventurous for your next office fit out, contact us to see how we can help.